That's what my family saw at a local farm stand recently. This time of year, farmers markets are full of luscious colors and unique produce! It all adds to the excitement of the season. We snacked on our pears all the way home. Meanwhile, I wracked my brain for a recipe to use these delicate beauties before they could go bad. So what did I decide to do? 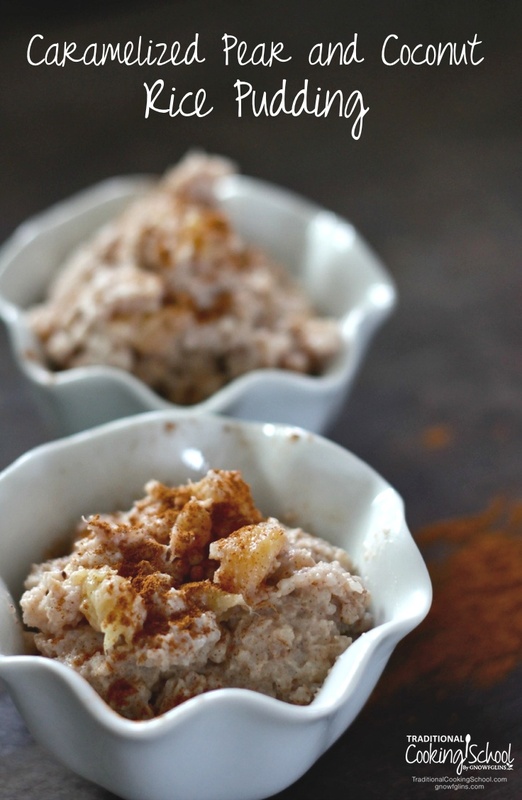 Caramelize them and make a rice pudding! I wanted to use coconut milk and “work it” with a technique similar to risotto. I prefer to use white rice instead of brown rice in our home because of the phytic acid content of brown rice, but this dessert requires white rice anyway. You could easily use butter and whole milk instead of coconut oil and coconut milk. 2 drops of an immune-boosting essential oil blend added such a perfect spice flavor to the coconut. Gorgeous red, perfectly ripe pears...That's what my family saw at a local farm stand recently. We snacked on our pears all the way home. Meanwhile, I wracked my brain for a recipe to use these delicate beauties before they could go bad. So what did I decide to do? 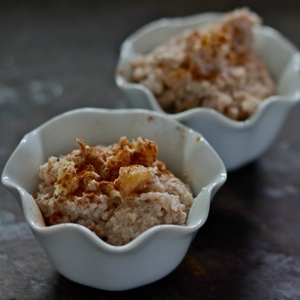 Caramelize them and make a rice pudding! Heat the coconut milk with the vanilla and essential oils in a medium saucepan until warm. Keep warm while preparing the rice. Heat the coconut oil in a large saucepan, then add sweetener, cinnamon, nutmeg, coriander, and salt. Stir until the mixture is bubbling and golden brown. 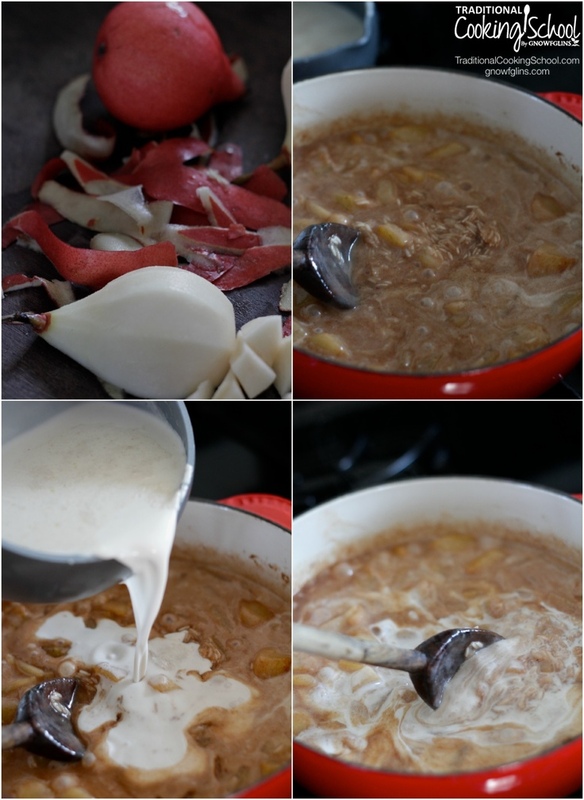 Add the pears and sauté for 5 minutes. Stir the rice into the pan. Add 1/2 cup of the warm coconut milk and stir until the milk absorbs into the rice. Add another 1/2 cup of warm coconut milk to the rice, then stir until the mixture absorbs. Continue this process until the rice is soft, thick, and creamy. Season with additional cinnamon and salt as needed. 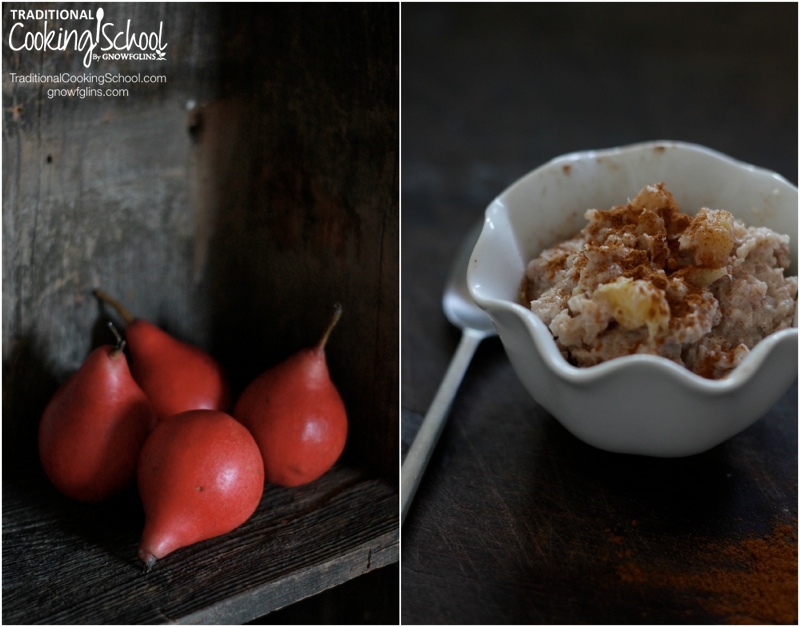 Will you make this Caramelized Pear and Coconut Rice Pudding? Please share about a recipe you created or your family enjoyed because you found a beauty at the Farmers' Market! This post was featured in 57 Scrumptious Egg-Free Desserts and 90 Nourishing Egg-Free Breakfasts. Roz lives right by the beach in Southern California with her husband and three daughters, and blogs at RealFoodFamily.com. Her family's faith in Jesus is the most important part of their daily life, and they are actively involved ministry in their church as well as supporting world-wide missions. Roz is a former Broadway performer (Wicked) who turned her career passion to nutrition and natural living when they were expecting their first daughter. Roz holds a bachelor's degree in Health Arts and Sciences, is a Certified Nutritional Therapy Practitioner (NTP) and a certified Birth Doula. Roz blogs about traditional foods, natural living, urban homesteading and homeschooling at Real Food Family. You can follow her on Pinterest, Facebook, Twitter, Instagram, YouTube, and Vimeo. I love risotto! I hadn’t thought about making rice pudding using a similar technique. Since I don’t have this/these essential oils, would i just add more spices.